Symphony is the neutral premium telecom network service provider. Metro Ethernet is the high speed network service, using Ethernet technology, using fiber optical as the main networks to support huge data transmission in Bangkok Metropolitan and vicinity. It offers stability and high quality of service with network backbone capacity up to 20 Gbps and the resilient backup system for network trunk routing. The backup system automatically manages an alternate route in less than 50 millisecond whenever network operation problems occurred, in order to carry 100% smooth data transmission. Symphony also provides “Customization” any to meet varied standards and applications of diverse businesses by a consultative teams certified by international vendors. 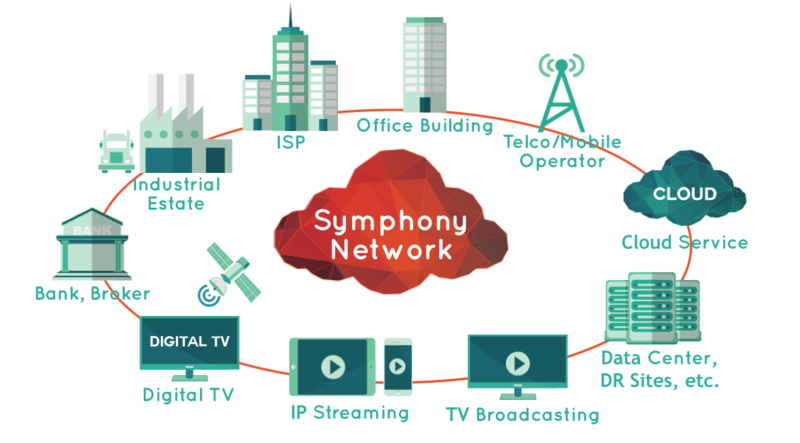 Currently, Symphony offers high speed Metro Ethernet service from 1 Mbps up to 10 Gbps. Higher speeds can be provide as businesses acquired. Ready Ethernet is Ethernet service within leading commercial buildings in Bangkok Metropolitan areas. Symphony has installed ready-to-service fiber optics and network equipment covering every floor of each commercial building. 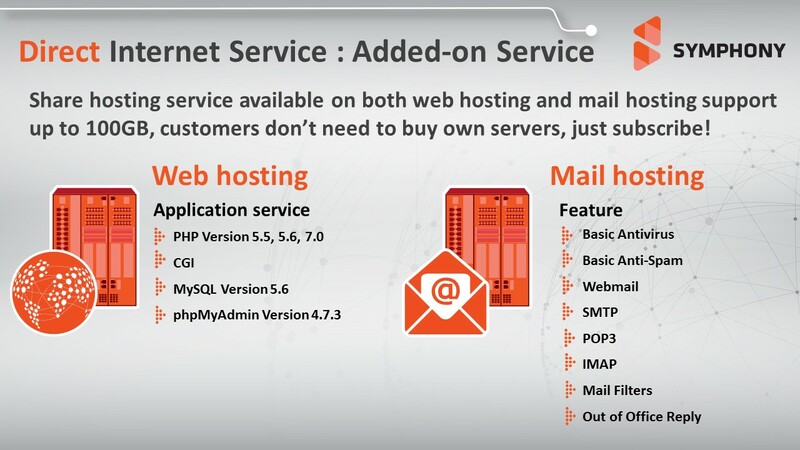 Therefore, installation to customer’s office can be done within 8 working days. 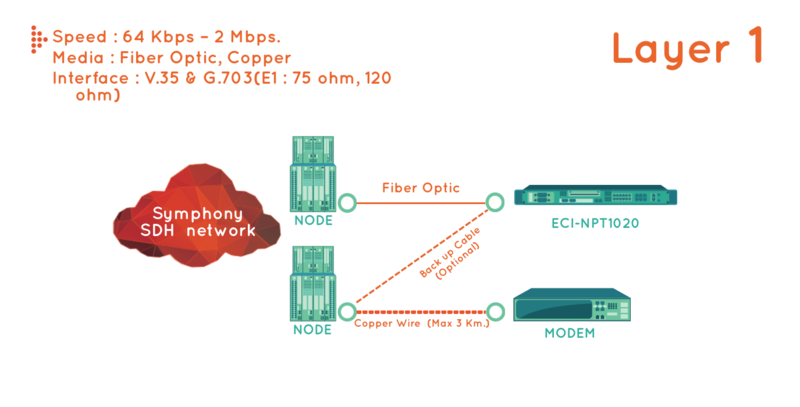 Those physical building nodes are interconnected to the main optical trunk networks which are configured as Metro Ring networks capacity of 10 Gbps. 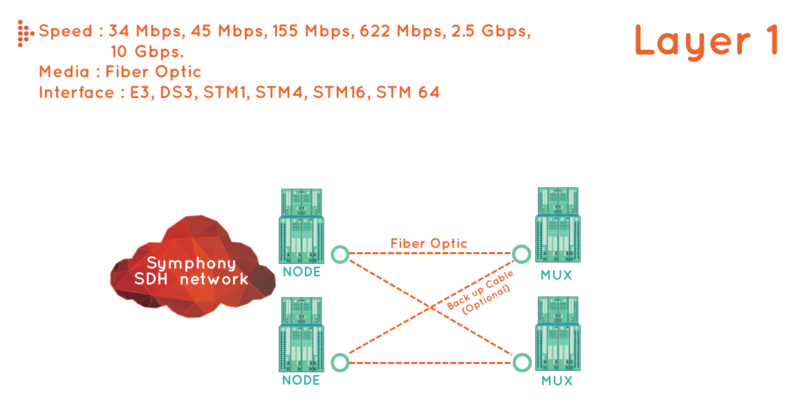 Every node in the network platform is wiring by two different routes of Fiber Optics with 100% backup bandwidth. This networking solution can provide alternative routes in an emergency case and secure data transmission recovery when problems occurred in the network, as a result customer can transmit data at the same speed rate as normal. 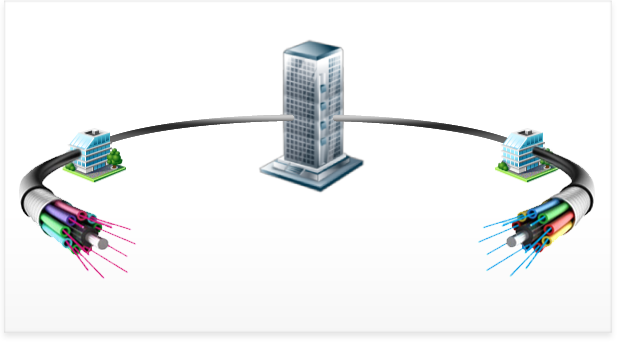 Ready Ethernet offers high speed from 1 Mbps via optical fiber network interconnections. It provides stability of data transmission and higher resistance than general copper wire. 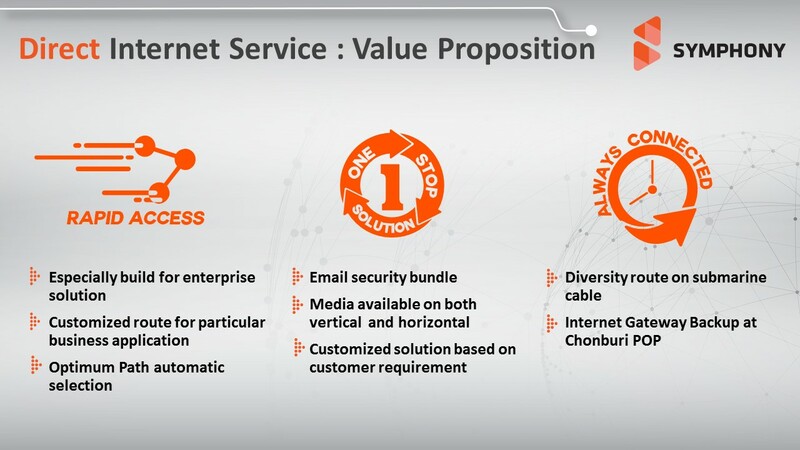 With the utilization of network sharing 1:1 ratio, customers are assured of high-speed data communication service according to subscription package. Moreover, Ready Ethernet is scalable to your business application needs because our optical network equipment capability can support up to 1 Gbps with easy configuration by Network Management System. All installed equipments in the network backbone and terminal equipments at customer premises are selectively high quality and all in one single brand which simplified one single network controlled and network monitoring system with high performance. Time Division Multiplexing (TDM) TDM transmission technology is a type of multiplexing that combines data streams by assigning each stream a different time slot in a set. TDM repeatedly transmits a fixed sequence of time slots over a single transmission channel. This technology basis enables TDM to assure the high quality of data circuit such as bandwidth, performance, reliability, and response time. TDM technology is suitable for real-time data transmission. 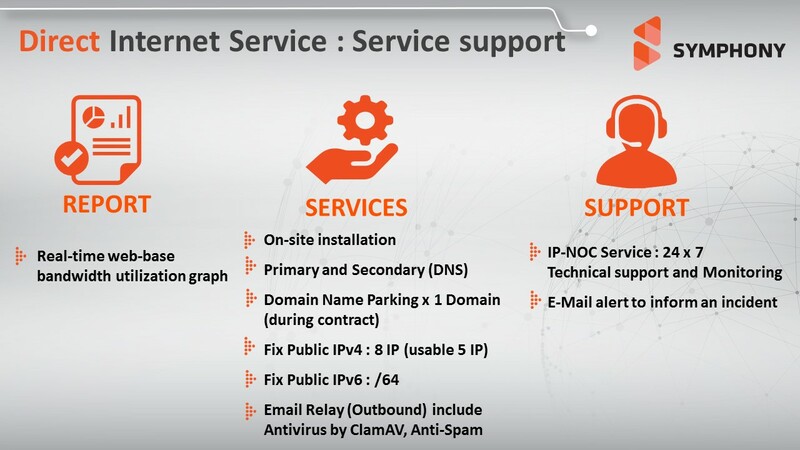 Our network infrastructure consists of the fiber optic core networks with last mile copper wires service network connected to customers. Presently, Symphony offers TDM speed from 64 Kbps up to 2 Mbps with European-standard quality Modem featuring remote speed control adjustment from our operation center, without terminal equipment change at customer site. The modem interface supports variety connectors of V.35 and G.703 which facilitate a prompt service to customer. Our Power Alarm System provides monitoring function inspecting cable signal errors, unusual other defects caused by modem, etc. The alarm function pre-detects and alert our operation center to immediately resolve problem before customer informs an occurred errors. With these excellent features, TDM thus far gain customers’ trust and widely used e.g. financial industry, telecommunication industry, multinational companies, etc. Synchronous Digital Hierarchy (SDH) is a high speed circuit using SDH technology in sending and receiving high speed digital data developed from TDM technology by increasing the capacity level by last mile fiber optic network. There is reliable control system with uncomplicated and reliable capability to transmit long distance data. There is also route protection system with the ability to switch transmission cable in the event of damage incurred to regular cable to ensure continuity and reliability of data transmission. Presently, the company offers SDH service from 34Mbps. to 10 Gbps. via fiber optic cable to diverse customer i.e. domestic mobile telephone service provider, international telecommunication network provider or multinationals network system provider etc. Ethernet over Synchronous Digital Hierarchy (EoSDH) is an exceedingly high speed circuit using Ethernet technology based on SDH network which is developed from the existing technology by combining the distinctive characteristic of each technology i.e. 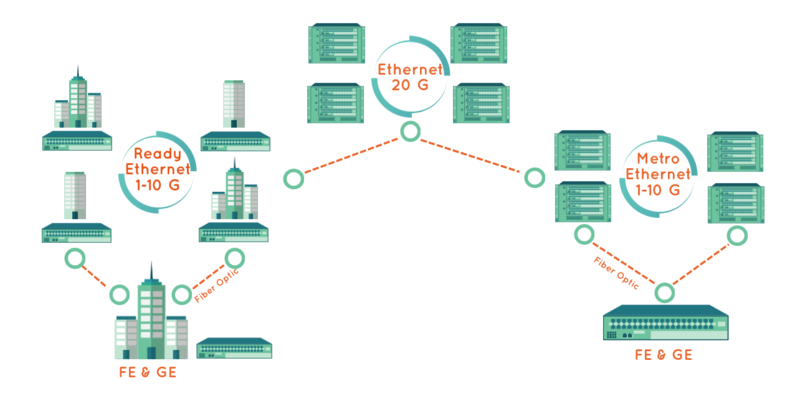 the outstanding feature of Ethernet is its ease of usage and prevalence whilst SDH is recognized for its reliability; hence, this combined technology is suitable for users that need reliable data transmission via Ethernet connection. 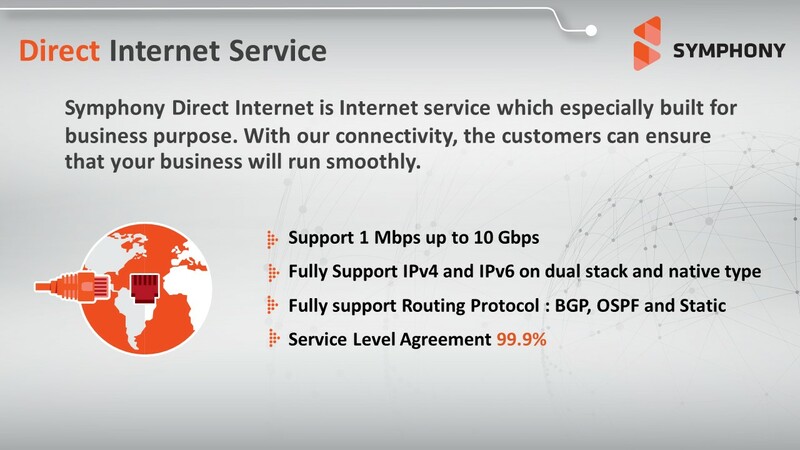 Presently, the company offers EoSDH service from 2Mbps. to 10 Gbps. by combining SDH’s distinctive characteristic of reliability in service with the widespread usage of Ethernet interface whereby this technology is suitable for users that require reliable data transmission based on Ethernet connect i.e. multinationals etc. Dark Fiber provides data transmission service via fiber optic to specific customers that require management and control over internal data transmission within division with specially designed source and destination equipment for their transmission; hence, customer are liberally to determine transmission speed and equipments at their own choices e.g.